Updates added to the BEAVERTAIL and TPO overhaul pages. First Prize - Silver Driving Experience - Mr S.Evans, Aylesbury. Second Prize - 2x Charnwood Forester tickets - Mr B.Bass, Barnet. Third Prize - 2x South Yorkshireman tickets - Mr F Martin, Burton. Runners up prizes (GCR round trip tickets) to M.Dickman, G.Maslin, D.Maslin, M Nutbeem, A.Jones, L.Edwards, C.Daly, C.J.Perkins, M.J.Foreman. If you are one of the winners you should receive your prize shortly. Thanks to all who supported this raffle. NEW PRESIDENT - Dorothy Green was successfully elected to the position of President at the AGM. TPO roof continues to progress well and the new canvas is scheduled to be fitted on 11th December - any extra help will be appreciated (Rothley from 10am onwards). Raffle was drawn on Saturday - list of winners to follow. 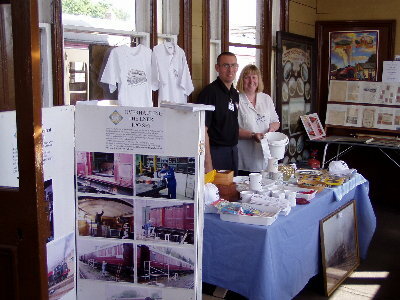 Further updates added to the BTK page and photo of stand at Burton Rail fair in the Gallery. AGM and RAFFLE DRAW - both take place at Rothley this Saturday (27th). The AGM will be held in a carriage at rothley shed starting 14:30 - all RVP members and shareholders are welcome to attend. The raffle draw is scheduled for 3pm (may be slightly later if AGM overuns) and will also take place at Rothley. Stubs for the raffle can be accepted at Rothley until the time of the drawer itself. This is particularly important for MLST members as "Main Line" has been mailed out late. Please get any stubs and cheques to Rothley either by delivering them to the shed or asking the guard to give them to rothley station staff on morning GCR trains. BURTON RAILFAIR - Burton Railway Society's railfair takes place on Sunday 21st Novemeber at Burton Town Hall. We have been invited to take a stand and will have a sales and display stand. Donated items to sell are welcome (particularly videos) - either bring to Rothley shed by Saturday 13th or e-mail me (above). If you are in the Burton area do visit us at what is normally a very well attended event. BEAVERTAIL bogies were swopped as planned yesterday, see Beavertail page. MORE ARCHIVE PHOTOS ADDED- some better quality archive photos of our early years have been added to the gallery, showing the LTSR coach, LSWR milk van and 7597. Thanks to Dave Thomas for these. Further update added to the Beavertail page. HRA WEBSITE COMPETITION - it is pleasing to note this website came fifth in our category in the Heritage Railway Association website competition - not bad for a relatively new site (and, yes there were more than 5 entries:-)). Updates added to Beavertail and TPO overhaul pages. BEAVERTAIL - Update added to the Beavertail page. If you are an RVP member you should have received some raffle tickets with the current newsletter. Please support this raffle if you can, we need to keep the funding flow in place to see the work continue as rapidly as it has to date. MLST members should receive raffle tickets with the next "Main Line". If you fall into neither of these categories please consider making a donation or contact me for tickets - again refer to beavertail page. A picture of the BZ and pigeon van running as part of a parcels rake at the diesel gala last weekend is now in the gallery. TPO SET RE-ROOFING - Work on the recovering of the tender roof has started - see the TPO overhaul page.An update on the Beavertail will follow later this week. CHIP & BEER TRAIN - The working members wil be comandeering a coach on the evening "BEEREX" as part of the GCR diesel gala next Saturday(18th). Train leaves Loughborough at 6:50 and returns around an hour later. For RVP members free beer will be provided, and chip orders taken (please order by 4pm Saturday, please e-mail Darren for further details). The free beer offer is for RVP members only, but the train is open to the public at standard GCR prices. TPO overhaul page updated - see special features page. TPO set overhaul - The overhaul enters its next significant stage shortly when the tender (70268E) goes into Rothley shed to have the roof canvas renewed. This is a major job that is expected to occupy at least 6 weekends of volunteer time. The old canvas has to be completely removed, the sprung boards pulled back into position and bolted, roof sanded and filled and the new canvas fitted. It is our intention to concentrate all volunteer activity on the roof to get it completed as quickly as possible, but WE NEED HELP!. If you can spare any time over the next six weekends (from 18th Sept onwards) please contact me (or turn up at Rothley 9-5 Saturdays). 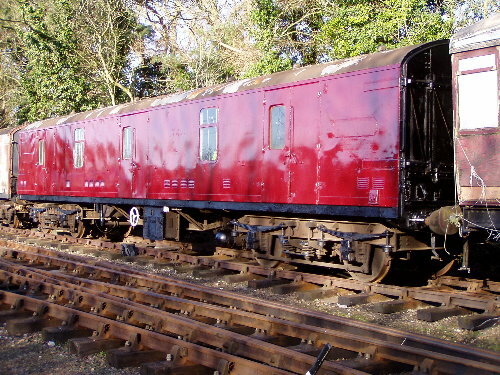 It is hoped that the bulk of the bodyside repanelling can also be completed while in the shed - thus taking the overhaul a considerable step closer to completion. BRIAN GREEN - It is with considerable sadness that I have to report the sudden death yesterday of RVP President, and former Chairman, Brian Green. As many will know Brian was very active within RVP for many years. With his background as former Chief Inspector at Leicester Head Post Office his particular interest was the postal side of our collection and, of course, the Travelling Post Office vehicles. He was instrumental in raising RVP's profile amongst the local museum community and forming our own collection of postal history within the LNER TPO set. This went on to win our first award for restoration in 1998. For several years Brian formed and run our regular Monday group of volunteers at Rothley - his ability to produce results from the absolute minimum of materials gained much light hearted banter, but respect and loyalty in far greater measures. He had taken the reluctant decision to retire from active volunteer work in April, but was still very much involved and continued to visit Rothley and the railway regularly. Brian cared passionately about both RVP and the GCR in general, and would promote both whenever the opportunity arose. I personally will miss his enthusiasm and advice. Our sympathy goes to his wife, Dorothy, and the rest of the family at this difficult time. Details of the funeral arrangements will follow when known. There will also be a card for Dorothy at Rothley shed on Saturday 21st for anyone who wishes to sign it. NEW MEMBERSHIP SECRETARY - Tim Pryce has been appointed Memebrship Secretary, replacing Mike Lang. Tim can be conatcted by E-mail or by post at 203 Shobnall Road, Burton On Trent, DE14 2BE. The membership forms have been updated and new versions will appear on this site shortly. We'd like to thank Mike for administering the membership scheme over the past two years. 24278 APPEAL LAUNCHED RVP are today launching a £5000 appeal to fund the purchase of teak panels for 1937 built Gresley buffet car No.24278, as part of an arrangement that will see ownership of this vehicle transferred to RVP. 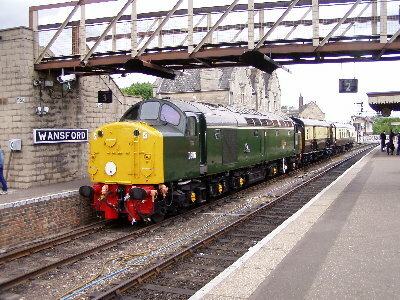 24278 is currently owned by Mike Lang, who has funded most of the extensive restoration work it has received to date (with some grant assistance from Main Line steam Trust). To date the underframe has been fully restored, the roof completely renewed and the fire damaged framework replaced. To complete its restoration it requires only the fitting of teak panelling and interior fitting out. The intention was to fund this through the rolling program of fund raising for the teak train. However Mike has now offered to donate 24278 to RVP, and we (of course) intend to accept! However if we are to maintain progress on the restoration we must quickly raise £5000 to purchase the teak panels for this vehicle. We therefore hope that those who wish to support our aim of seeing a train of teak vehicles running on the GCR will respond to this appeal to enable us to quickly progress the transfer of ownership and secure its future with us. The rest of tis restoration will then be funded through our normal rolling fund raising program as originally intended. LEICESTER HERITAGE AWARD CEREMONY - At the awards this evening we recieved a Commendation for the restoration of RB 9124E. Congratulations to all involved in the rebuild and recent repaint of this vehicle. 9124E was beaten in the restoration category by Appleby Magna museum, which looked a worthy winner from the photographs shown. 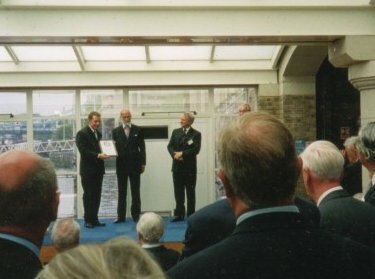 Chris Lang received the Transport Trust award from HRH Prince Michael of Kent in London for the restoration of the BZ added to the gallery. CCT 94125 LEAVES - This vehicle is expected to the leave the GCR today en-route to its new owners, the North Norfolk Railway. Our sales and display stand attended as planned. In fact we were generously allowed space both inside and outside the waiting room on the main platform. Tim and Claire manned the inside stand. Les and Tony looked after the outside stand. Mick Yates, Chris Lang and Paul Harrison also helped out to provide cover for meals and train rides. The stand raised just under £300 towards the overhaul of our TPO set. Many thanks to the Nene Valley Railway for inviting us to this very well organised event. AWARDS - Last week the presentation was held for the Transport Trust Award, received for the restoration of BZ 70654E last year. The event was held in London and Chris Lang (who managed this project) collected the certificate for us. This will be displayed in an appropriate place in due course. This year we have entered 9124E in the Leicestershire Heritage awards. The judging party visited it today and took a round trip while having a GCR breakfast cooked in its kitchen. Finally we have entered both 9124E and 70654E in the Heritage Railway Association carriage awards - judging for these will take place over the summer and the results will follow here when known. 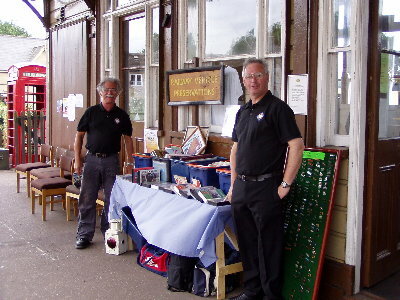 NENE VALLEY TPO GALA - The NVR have invited RVP to take a sales and display stand to their gala on 19/20th June. We will have a stand there both days and, in addition, those manning the stand have been invited to a buffet on the Saturday evening at Wansford. Approximate numbers of volunteers are needed, so if you're an RVP member and want to help out please e-mail me (above). I'll need to know if you intend to stay at Wansford for the Saturday night (If numbers are sufficient I'll try and find local accomodation for those who need it). Please respond by 9th June. We would like to record our thanks to the Nene Valley Railway for their inviting us along to what promises to be a very good gala. HERITAGE RAILWAY ASSOCIATION - We are pleased to announce that our application for membership of the Heritage Railway Association has been successful. WORK WEEK REPORT - a report on the TPO overhaul and our activities during the work week is now on the special features page. Including in here are pictures from Brian's retirement meal. PIGEON TRAIN 3rd MAY - As part of the GCR's 1950's gala Pigeon van 4050 will be carrying pigeons again on the bank Holiday Monday. The pigeons will be loaded at Loughborough at 12:00 and travel to Leicester and back on the 12:15 round trip. The pigeons will be released at Quorn on the 15:00 from Loughborough. EVENING MEAL - BRIAN GREEN RETIREMENT - The meal to mark Brian's retirement will again be held at the Rose and Crown, Zouch (near Hathern) on THURSDAY 29th APRIL, 7.30pm. Bookings are now being taken - please E-MAIL using the link above. A £5 deposit per head is required (to be paid by Saturday 24th April). As in January we will need to pre-order the meals. Menu's will be available from Saturday 17th. I must have these back by the 24th. MENU AVAILABLE - if you've reserved a space you should have recieved it by e-mail (if not let me know) - Please choose your starter and main course, and pay the deposit by 24th April. WORK WEEK 2004 - This years work week starts on Monday 26th April and runs to the following Saturday. This year work will be focussed on the LNER TPO set. We need a good attendance as we have a very heavy workload. The main tasks will be sanding and painting togehter with repairs to woodwork, brake rigging, corridor connections and exchange equipment. This requires a variety of skilled and unskilled work but certainly requires plenty of volunteer labour. Please consider coming along - for our further flung members some accomodation will be available. Note also that Brian's retirement meal is being held on the Thursday night of the work week. BRIAN GREEN RETIREMENT: It is with some sadness we announce the retirement from active RVP service of Brian Green, director and former chairman of RVP Ltd. Brian is retiring as he feels no longer able to actively participate through advancing years. However Brian has asked to remain as President, a position we are more than happy for him to continue holding. He will therefore continue to attend social events and write in our newsletter.As many members will know Brian was instrumental, as former Chief Inspector at Leicester Head Post Office, in developing the postal side of our collection. The collection of items displayed in the LNER TPO set was largely the result of Brian's hard work (ably assisted by his colleagues in our "Monday Gang"). The collection was built up from 1980s to date as the post office embarked on the closure of Sub Post offices and also sorting offices with the introduction of mechanised sorting. As equipment became surplus and obsolete it would have been scrapped had not Brian had the foresight to beg and scrounge items which were gladly donated to Brian for the museum by Head Postmasters.This display won the Leicestershire Heritage Award in 1998, and went a considerable way to raising RVP's profile in the local museums world. The RVP board would like to record our thanks to Brian for many years of hard work, and we wish him well in his (second!) retirement. To mark his retirement a evening dinner will be held in late April. Members and friends of Brian should contact me for details. CCT SOLD - One of our CCTs, No.94125, previously used for storage space, has been sold. It was made surplus by the donation of GUV 93579 by Fragonset Railways, and a major sort out of our spares has followed. 94125's new owner is the North Norfolk Railway, where it is to be overhauled and returned to service for the carriage of bikes. Of our two remaining CCTs one will become the workshop (a project that has become more urgent after our current workshop van lost its roof in last weeks storms), while the other will be retained for now. Not such good news on the expected transfer of our sleepr car 380M elsewhere - unfortunately its expected new owner cannot now take it for reasons beyond our control. We therefore remain open to offers for this vehicle. FILMING CONTRACT - Post Office Sorter 80301 was today (11th March) used for a small filming contract. Its not exactly clear what the filming is to be used for (some kind of publicity film?) but it apparently involved an inflatable sheep as well as people sorting mail. If anyone does see this footage crop up somewhere do let us know! A donation has been received from the company involved and thanks to Tim Pryce for staffing the vehicle for us. SOUVENIR COVERS - through the generousity of Benham Ltd and Great Central Railway PLC we have been given 50 of the souvenir covers produced for the launch of the railway stamps in January. These are very nicely produced limited edition covers featuring the O4 stamp and a photo of "Kohlapur". ALL proceeds from the sale of these will go to the work currently being undertaken on the TPO set. PRESS COVERAGE - We feature in three current railway magazines this month. Firstly "Steam Railway" carries a picture of 9124E and brief report (in which it states its an RVP owned vehicle - in fact its is owned by a member, apologies to its real owner!). Secondly "The Railway Magazine" carries a photo of the TPO set and staff posed at Loughborough on 23rd January (we have also been sent a different photo taken on that night and this is now in the gallery on this site).Lastly this website gets a brief mention in "Heritage Railway" in the regular column on websites - a special welcome to anyone who has followed their advice and is visiting this site as a result! TPO SET ARRIVES AT ROTHLEY - The LNER TPO set was moved to Rothley shed at the end of last week in readiness for its overhaul. Work will hopefully start this weekend (6/3) with a coat of roof paint (weather permitting), but the main period of activity will be our work week starting 26th April when the work will start in earnest on overhauling the brake rigging and exchange equipment, and repainting the bodysides, To complete this (and a host of other work) we need as many volunteers as possible - can you spare a few hours (or days!)? The major shunt at Rothley took place today (20th Feb). this released two CCTs, put the third in place for conversion to a workshop and put the new stores van (93579) on the storage sding. The GUV is now resplendant in a full coat of maroon. SALE OF SPARES - As part of the re-organisation of our stores stock we are now disposing of several items relating to mark 1 coaches, steam and diesel locos and a host of miscellaneous stuff. Details have now been added to some items and others are being auctioned through E-bay. Please view the list and make an offer. Sales will continue on a rolling basis until all items are sold. THOMAS POST TRAINS - As part of the GCRs Thomas event running from this Friday through to Monday our Mk1 TPO 80301 will be on display in Loughborough station coupled to "Thomas" himself. We'll be staffing the TPO Saturday and Sunday to demonstrate sorting and for sales of souvenir covers. 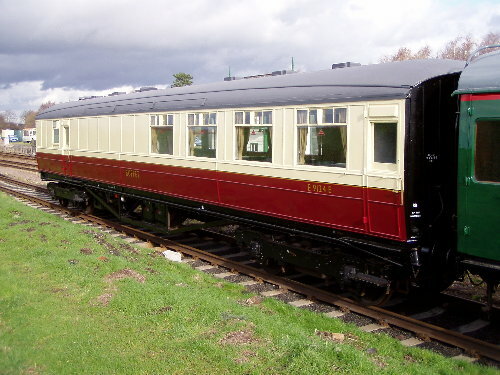 The GCR would also like to have it open on the Friday and Monday - if any RVP member is able to staff this vehicle on these days, even if just for a couple of hours please contact me. The overhaul, repanelling and repaint is now complete and it is now back in GCR service. This time it has been outshopped in full blood and custard livery - the only serviceable Gresley carrying this livery in the UK. MORE PHOTOS ADDED TO GALLERY - Pictures of our early years have now been added to the gallery. Many of these are fascinating showing our earliest vehicles and the purchase of what are now some of our best known vehicles (e.g. the pigeon van at Loughborough in blue livery, 24278 in blue/grey as purchased at Leeds). The quality of some of these photos is poor as they have been scanned from very early editions of our newsletter - I intned to add extracts from these early newsletters as they tell the story of how the group evolved in those early days. There are however many gaps - does anybody have a full set?? MAYOR OF ASHBY VISIT - The mayor, Mr Gerry Pointon, visited the Mail set during the winter gala as our guest. Mr Pointon previously worked for the Royal Mail in Leicester and therefore has an interest in our efforts to recreate mail history. He travelled with us during a mail exchange and tried his hand at sorting mail on the move. He then viewed the next exchange, joining the large crowd at Quorn. I understand he was most impressed with his visit and I would like to thank all for the professionalism both us and the GCR are able to display on these occasions. GALA REPORT - The "Mail on the Rail" gala was hugely successful. All 8 mail exchanges went smoothly. Many thanks to all of the TPO crew, the GCRs staff and volunteers and the visiting TPO crews off the North Eastern TPO for making the event such a success. Large crowds were at Quorn for each drop and this is reflected in the takings from the collections made there - which will go some considerable way to paying for the vehicle's overhaul this year. In addition we were visited by the Mayor of Ashby on the Sunday morning. Photos of the event are now in our gallery, also have a look at the news page on the Great Central site. The LNER TPO vehicles have now been withdrawn for mechanical overhaul and are expected back in service early in 2005. In the meantime our other TPO (80301) remains in service and will next be in use as part of the "Thomas" gala on 14/5th february. BR standard 4 (68p) steam loco stamp - 8 ONLY - £2 each. FULL SET - one of each of the above covers for £10 (first come first served). Once these numbers have sold out no more will be produced, and our date stamp for 24th Jan will not be used on any other covers. 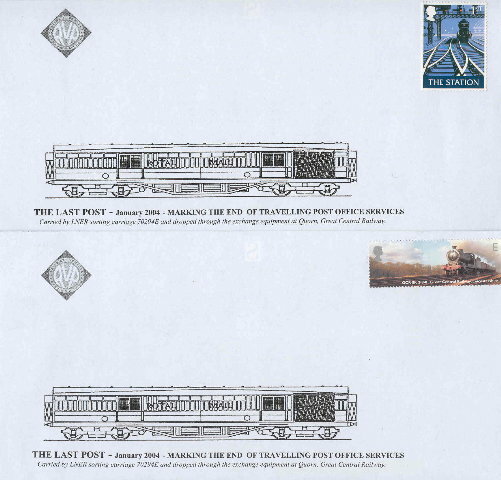 Demand for these covers will be high (particularly the GCR O4 stamped one) TO RESERVE ANY OF THESE COVERS e-mail me. Reserved covers can be picked up at the gala (after first TPO trip) or posted out (for an extra 20p postage).Please note these covers will be cancelled on the TPO they cannot then be sent on through the post. We can however provide uncancelled versions of the covers on request.ALL PROCEEDS FROM THESE COVERS GO TO THE OVERHAUL OF THE TPO SET LATER THIS YEAR. UPDATE - 28/1/4: Only 6 of the "Dolgoch" stamp covers are left. In addition just ONE of the GCR O4 stamp covers remains (having got lost in the box!). Contact me immediately if you want any of these - first come first served. MORE PICTURES ADDED to the gallery, particularly from the eighties. Some of these are of poor quality but are fascinating. There are also some mysteries - are you the star of some of these pictures or do you know the date? In addition a "special features" page has been added and Mick Dickman kicks this off with the story of the BZ restoration. Anyone want to contribute an article on any other subject? TPO IN EVENING PHOTO SHOOT - 23rd January - The TPO set will be playing a prominent role in the evening photography session at Loughborough on the evening prior to the Winter gala. We have been asked to open the set up for photography so a few TPO staff are required - if you are able to attend please contact me. You will need to be dressed in full TPO uniform for the benefit of the photographers. This is about 5 miles from Loughborough (near Hathern).Unfortunately the GC Hotel no longer do evening meals so we've had to go elsewhere and this place was recommended. We have an absolute maximum capacity of 30. Please let me know immediately if you want to attend and how many places. I also need a £10 deposit per place - I must receive this by January 13th at the latest (ideally at Rothley on the 10th). Make cheques payable to me please (not RVP) - if I do not receive the deposit in time we will not be able to confirm your places.At the moment we don't have a total cost - Mike Lang will be getting menu's on the 14th and we are suggesting that you select whatever you wish. We will ask for a fixed price three course option and I'll let you know if they can do this. In any case your £10 deposit will (obviously!) be deducted from the cost of whatever you choose. LOCOS THAT HAVE WORKED THE TPO SET over the last 22 years on the GCR- This list has been compiled by Tim Pryce and makes interesting reading - many of the most famous locos in preservation have hauled our TPO set (perhaps a record for a set of preserved carriages?). Anybody want to correct / add to the list or send photos?